A teenage armed robber has been jailed for over four years after pointing a gun at a terrified jeweller and fleeing with £10,000 worth of gold chains. 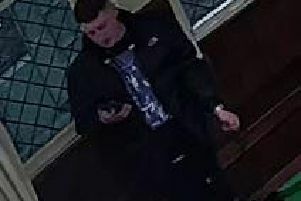 Timothy Moloney (19) burst into Gouldbuys jewellery store on Flowergate, Whitby clutching a hold-all and wearing a face mask, hoodie and orange gloves. He pointed an imitation pistol at owner Alan Slater who bolted to a back room while Moloney scooped up 25 chains before speeding off in a waiting getaway car. A passer-by gave chase but was stopped in his tracks when Moloney pointed the gun straight at his face, shouting: “Bang!”. The robbery happened at 10.30am on May 1 - the day the Tour de Yorkshire cycle race came to Whitby. Moloney, a former army cadet and hotel worker, was arrested two days later following phone calls to Crimestoppers and rumours on social media. He appeared for sentence at York Crown Court on Friday after admitting robbery and possessing an imitation firearm with intent. Prosecuting barrister David Hall said before the robbery, a hoax call was made to police warning them a bomb had been planted on the cyclists’ route and was a deliberate attempt to divert police resources away from the town centre, where the raid took place. The hoax 999 call was traced to a phone box in Whitby and police were dispatched, but no-one was caught and the investigation is ongoing. One witness said the night before the raid Maloney told her he was planning an armed robbery because he owed drug debts. Following the heist he travelled to Manchester and sold the jewellery for £3,500, but spent a third on clothes and a night out. Neither the chains nor the gun have been recovered. Taryn Turner, defending, said Moloney went off the rails at 16 following his parents’ separation and was abusing illegal substances.